ROME – In his customary cordial way, President Giorgio Napolitano read the political elite of Italy the polite equivalent of the riot act. On Tuesday the president made his traditional end-of-year address to the ranking elders of the Italian state, and it obviously represented a carefully considered sermon in which he urged quarreling parties (but also factions within parties) to engage in a positive dialogue. This appeared likely to be his last such Christmas greeting in the Quirinal Palace. Napolitano’s remark that he had “personally committed himself to guaranteeing institutional continuity until the end of the European semester” is being read here as a deadline because those six months, during which Premier Matteo Renzi, 39, heads the Council of the European Union, end Jan. 13. While not yet a swan song, the implication is that Napolitano, who is 89, will resign the day afterward, Jan. 14, ending his second term as president which would normally conclude only in 2020. With visible reluctance last year Napolitano agreed to serve a second eight-year term in order to quell a particularly intractable political crisis. Recently, however, he has made no secret of his readiness to hand over the reins. Time is limited, however. By law, within 15 days of the vacant office, the combined houses of Parliament plus 58 regional deputies must meet to elect a new president, chosen during the first three votes by a two-thirds majority, and after that, by simple majority. The choice is important, for the role of president goes well beyond the passive-ceremonial; when a government collapses, it is the president who babysits the nation while overseeing selection of a new government, which Parliament then votes into office. In his nine years as president, Napolitano has done more than merely wait for crises. 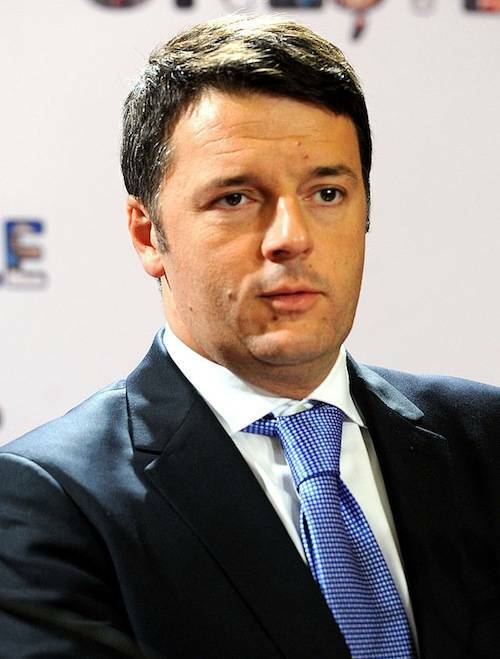 While never authoritarian, he has ensured stability for the country during the past eight years of severe recession, and polls show he is admired by 38% of the Italians queried, more than any other single politician, including Renzi, with 34%. 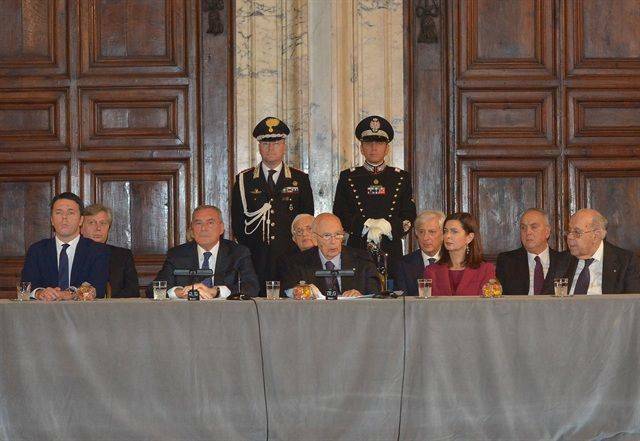 In his pre-Christmas greetings to the high representatives of the state, Napolitano began by saying that the situation calls for “institutional continuity,” or keeping the present governing coalition headed by Matteo Renzi in office as long as possible. With this signal praise for Renzi were particular words of regard for the “value and affability of Minister [Pier Carlo] Padoan,” minister of the economy and finance. The president had sharp words for the raucous minority within Premier Renzi’s Partito Democratico (PD), fraught with futile “hypothetical” discussions and demands for early elections which amount to little but a “waste of time and newspaper ink.” Napolitano also urged the PD and the antagonistic trade unions, who staged a national general strike last week in blatant opposition to the PD, to work toward a more harmonious relationship. Passage of one of Renzi’s coveted reforms, the so-called Jobs Act, which makes it easier to fire redundant workers, was praised. In the background are two remarkable developments, both unexpected. The first is the revival of the fortunes, and its debut on the national (rather than regional) political scene, of the formerly scandal-ridden Northern League under the direction of Matteo Salvini, the brash 41-year-old who has taken the place of former League head Umberto Bossi. 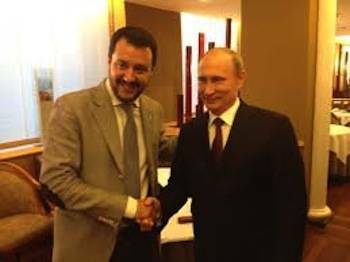 Among Salvini’s initiatives was to fly to Moscow to be received by Vladimir Putin. Salvini’s brief there was to sympathize with Putin on opposition to Western economic sanctions and to plead on behalf of Italy-Russia trade. The result: in current polls Salvini now outshines former Premier Silvio Berlusconi, by a stunning lead of 5% in this week’s La Sette poll. The second development is the spreading scandal of kickbacks and corruption which began in Rome, but has tentacles in both the North and South. After the first 37 arrests, more are expected. In the halls of justice meanwhile a huge debate is underway about exactly what the word “Mafia” means when applied to those arrested in Rome, as it is by the current prosecutor. An individual convicted of Mafia crimes is subject to particularly harsh detention under the terms of the “41 bis” Law. If not defined as a Mafia crime, prison detention is normal. Those arrested these past weeks in the Rome corruption investigation are protesting that the magistrates are unfairly calling them Mafiosi.